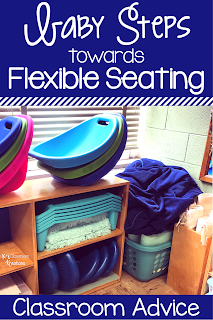 So by now, I am sure you've heard about flexible, or alternative, seating in the classroom. Am I right? 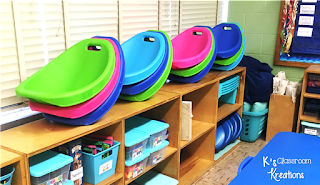 Basically it means providing a lot of different seating options for students to use throughout the day rather than only traditional desks and chairs. If you're wondering what the fuss is all about, or are curious but don't know where to begin- you are in the right place! 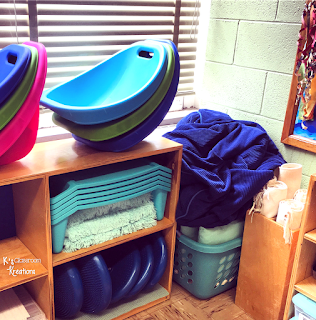 I've used a variety of seating options in my first grade room for the last 7 years and I can't wait to share some ideas with you. 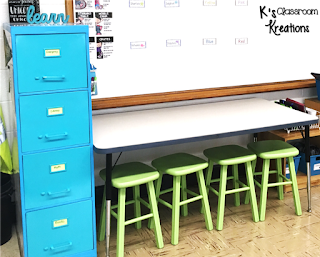 Before you go thinking you need to get rid of every desk and table in your classroom, I am here to share ways you can "take baby steps" towards a classroom transformation without breaking the bank. What's wrong with traditional seating? 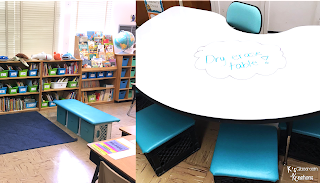 Flexible, or alternative seating is a choice, and one that I happen to believe strongly in after years of testing it out. If you're anything like me you may realize you even work better in your favorite recliner or spread out in bed than stuck in a hard chair! After refining my teaching style, I realized my kids don't really sit at their desks very often anyways. So, I slowly started making a change and have added a few new pieces each year. The purpose is to help our kids who may be a little wigglier than others, or who may learn best in a position other than sitting at a desk, find a comfortable way to learn. The goal is to create a classroom where each students' needs are met academically, behaviorally, emotionally, etc. At my school, I don't have the option of removing desks so I have had to get creative with how I can change up seating. At the beginning of the year everyone starts out in a regular desk chair. As we slowly learn station routines and I allow kids to chose a space to work around the room, I am also very intentional in having them try different seating options. After a few rounds we always come back as a group and discuss what went well with a seating option and what didn't. The goal is to help them find a seat that they feel is comfortable, and that helps them focus. I am honest with them- if it makes them want to play....that is not the seat for them (at least not at this time). The discussions and reflections are key! Oh, I also give them the run down of the rules and best practices with a certain seating option before they try it. For example...the yoga balls are to be used as chairs. I should not see them kicking them. Or throwing them. Or pretending they are Godzilla and destroying someone's work by rolling over it. And yes, every time we introduce a new seating option, or a new student arrives, we go through the expectations. At some points in the day we gather on the carpet as a whole group, usually without special seats except for maybe a few kids with wiggle cushions as needed. Remember, it's not about everyone getting a seat all the time. The goal really is to help them focus. Everyone DOESN'T need a special seat all day long. 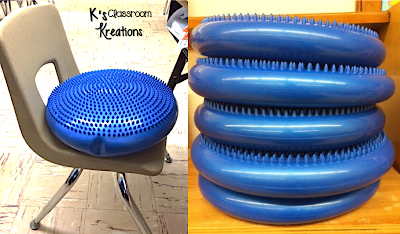 Other times kids sit at desks or at tables and can choose a cushion for their chair, yoga ball, etc. to use. Most choose a regular chair and that's fine with me too. They at least have the option. And finally during station time (I use the Daily 5 framework) they can spread out wherever they want for independent practice. This is when the scoop rockers, rugs, tray tables, and other seating options really come in to play. Stations are done...those big seats get stacked back up until the next time they move around the room (usually during math stations). 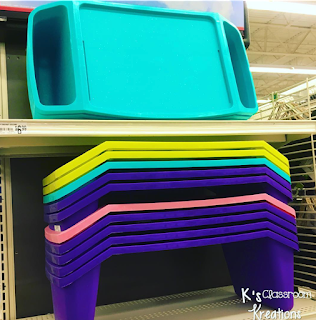 Remember, flexible seating doesn't have to look the same for every child. And your room definitely doesn't have to look like someone else's. Also, I'll the honest. The OCD/ADD in me goes a little nutty with the movement, nonmatching seats at desks, wiggling around etc. but I have to get over it. It's not about me. It's ALL for them. Like I said, I have to keep my desks and chairs. I keep the majority of my seating options in one area of my room. 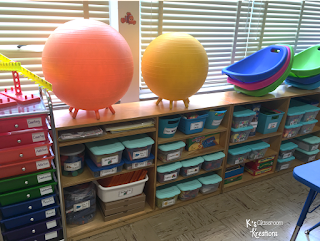 I stack my scoop rockers on top of low book shelves, along with a wiggle stool and yoga balls. I store rolled rugs and bathmats here too. The blue wiggle seats are usually always out on someone's chair but start here at the beginning of the year. I also use a laundry basket to store some pillows and a giant bean bag chair (shown above). Some options like the stools and crate seats are always at a table as their home base but kids do move them around the room as needed. To make the bench in the library I zip-tied 3 sturdy milk crates together and then screwed on a plywood/foam/vinyl top. Now the good stuff!! Here are some honest reviews of what's worked and what hasn't in my first grade classroom. Remember, every group of kids is different so what works for me (or doesn't) might have the opposite result for you- it's worth a try! The first seat I started using years ago were these wiggle cushions. You just inflate them with a little pump as full as you'd like. They have a pokey side and a smoother side. I leave it up to my kids to decide which side feels best for them. I started with 2 and now have 8. These stay out on chairs all day to be used at desks. Sometimes kids will take them to the carpet to sit on during whole group. 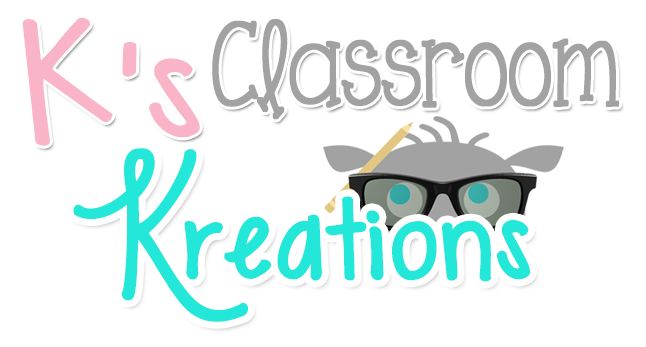 I try to make sure the kids I KNOW need one (sensory concerns or diagnosed ADHD) have first choice if they want to use one, if not the rest are up for grabs. A few years ago I was part of a pilot program that provided one yoga ball and holder to every child in my room. I was thrilled! It was the flexible seating I had always dreamed of. Then reality hit. Kids were constantly chasing balls around the room. Some saw them as toys to be bounced, kicked, or rolled even after MULTIPLE reminders. And the donut shaped ring was just one more thing to deal with. Don't get me wrong, some kids did amazingly well with them. BUT, the experience reminded me that a one size fits all approach wasn't what I had ever been about, and wasn't going to work for my kids. I gave most of the yoga balls to a different class and only kept a few as an option. I also bought some with the udder shaped legs. These I highly recommend. I have the yellow and orange. The little legs on there helped stop them from rolling away and they were viewed more as chairs than toys. They also have a donut shaped version that I am ordering to try this year, I'll let you know how it goes! Of course regular yoga balls can work great for some. I suggest trying. But remember it's okay to baby step in and try one or two before going all in full force. I LOVE all of the Hokki Stools and Wobble Chairs that I have seen online. These are next on my list of wish list items. For now, I have one that I bought on Scholastic with bonus points. Did you know they had seating options?? So fun! My kids like being able to spin a bit while also rocking. It does seem to scratch up our floor a bit so I have them put a mat under it just in case. I also found 4 wooden stools at a yard sale that I spray painted to match my classroom. My kids like putting these at counters or taller tables to work a bit higher up. You can find these at Big Lots, Walmart, or even online at Wayfair and Amazon for about $6-7 each. They recommend a 50 pound weight limit but my first graders have never had a problem, even at the end of the year. Basically my kids love sitting on the carpet with these because they get to rock or lean back a bit. I do have to occasionally remind them not to tip over but they usually do well with them They are a class favorite for sure!! 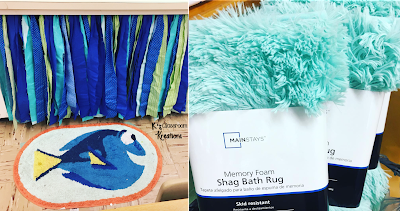 I work at a Montessori school so I inherited a lot of woven rugs when I began working there. My kids grab a rug to place on the floor and just roll it up when they are finished. I love them because it gets them to spread out around the room in a way that's a little more comfortable than a cold tile floor. Plus, they don't have to argue over space on the carpet. I also picked up a few fuzzy bath mats in the Back to School section of Walmart last year that are a little more cushy and foam based. Any memory foam bath mats or fuzzy mats would work well! My kids LOVE them and I plan to add more to my room next year. I keep them stored along with my other seating options when they aren't in use. 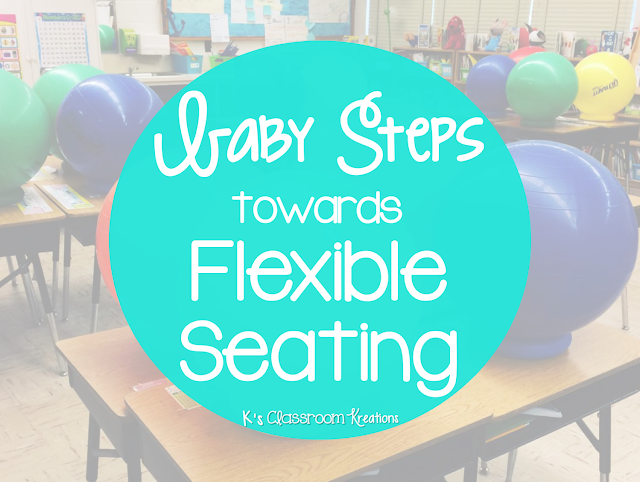 Well, I hope you've been able to find some new ways to add flexible seating to your classroom- whether that means baby stepping in and trying something new, or expanding on an already impressive collection- I wish you luck! Have a favorite I need to try? Let me know in the comments! 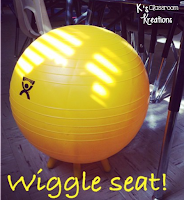 There's a great flexible seating called the Vidget. It's give you 3 different choices to use the Vidget.